MiniCRM Sales module organizes and prioritizes your leads and customers to help you increase your efficiency because you can close more sales successfully and pay attention to the really important customers. This module supports the process where leads become customers or sales opportunities to whom the sales was unsuccessful now but they won’t be forgotten so later you may close sales successfully. 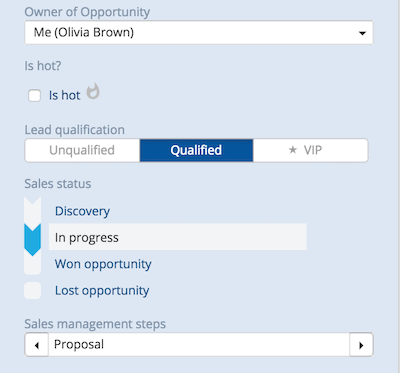 In the sales process, the cards are moving automatically between stages by setting the statuses and qualification so you will be up-to-date regarding the status of your sales opportunities. By setting the key fields, that are based on the qualification, the system prioritizes the sales opportunities automatically. Leads are qualified based on objective criteria, for example, company size, yearly revenue, number of existing customers etc. In order to qualify consistently, it is important to have a clearly defined target group that is known by every colleague. Qualification is permanent, it only changes at wide intervals (1-2 year). Unqualified: The lead doesn’t belong to the target group. It doesn’t mean that there is no chance to sell but it’s rare. Qualified: Ideal lead to whom you can offer a solution. VIP: You should pay special attention to them. 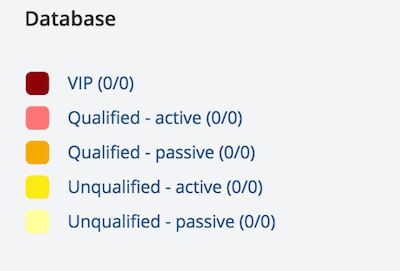 If you narrow your target group, VIP leads form the biggest part of it. 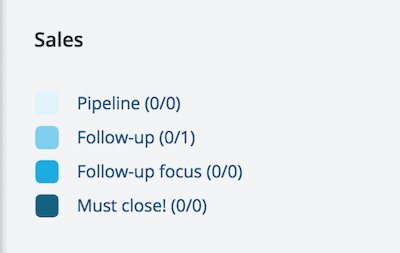 In this field, you can set the status of sales, whether it is still in progress or already closed. Discovery: It needs to be done before sales. Lead qualification and collecting basic data. In progress: The sales rep is managing the sales opportunity and spends as much time as necessary on them according to the lead qualification. Lost opportunity: Unsuccessful sales. Don’t worry, it can be successful later. If you check the Is hot field, the system will automatically increase the priority of the sales opportunity. Sales reps will know that they need to focus on them. You can manage pre-set steps in the ‘In progress’ and ‘Lost opportunity’ stages that help you follow what comes next and what is ready. ‘Pipeline’: There is little chance to close the sales successfully. If it is successful, you can be happy about it but do not waste your time. ‘Follow-up’: Focus on them, they belong to your target group. Even if they are unqualified, they are really committed and want to buy. ‘Follow-up focus’: They are the best customers: committed VIP or qualified. You can close the sales successfully if you work hard and don’t neglect them. ‘Must close’: They must be closed. They are committed VIPs or qualifieds who are in the last sales step. They are the closest to the success, don’t let them go. “VIP”: Closed lost VIP lead. They won’t be forgotten, you can target them with campaigns. ‘Qualified - active’: Qualified. They were in the Sales stage or they were customers. ‘Qualified - passive’: Qualified. They were in the Marketing or Database stage. ‘Unqualified - active’: Unqualified. They were in the Sales stage or they were customers. ‘Unqualified - passive’: Unqualified. They were in the Marketing or Database stage.